Amid rumors of a hostile takeover of the board of trustees, Washington Post reporter Matthew Mosk ’92 set out to investigate. What he learned about the struggle for the soul of the college surprised him. 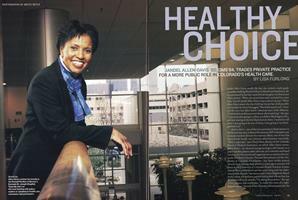 Jandel Allen-Davis ’80, DMS’84, trades private practice for a more public role in Colorado’s health care. 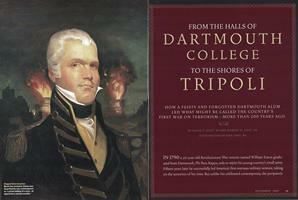 How a feisty and forgotten Dartmouth alum led what might be called the country’s first war on terrorism—more than 200 years ago. Think you’ve heard it all when it comes to Robert Frost, class of 1896? Here are three ways in which the poet is still making news. Retiring Dean of Admissions Karl Furstenberg looks back on 17 years as Dartmouth’s gatekeeper. 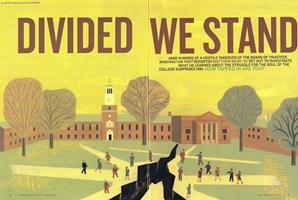 Every few years DAM queries about-to-be alums about their Dartmouth experience—and themselves. A childhood spent in Hanover allowed one future alum to start his College life earlier than most.